Based on this Promo, I think the mentor twist is pretty much confirmed. BB uses the word "Surprises" instead of the word "Twist". If it is a twist they would use that word. Last year they said there were 3 surprises. AKA, the 3 duos. There is gonna be a hantz in this season but which one. Find out soon. I cursed myself. I did this entirely with a joke now it has come to haunt me. First big scandal on BB14 already? I'm hearing rumors that JoJo had a falling out with production overnight and QUIT! And that she is being replaced today. I will follow up on whether the rumor is true or false, and if it's true, on how they handled the situation. Yeah I heard someone left as well but unsure again if it's true or not WTG WILL! You tell me if you think this is the Big Brother back yard. The pool is covered. those are the typical places where we see production during comps when the camera guys mess up and the size of the "House" seems to be about right. 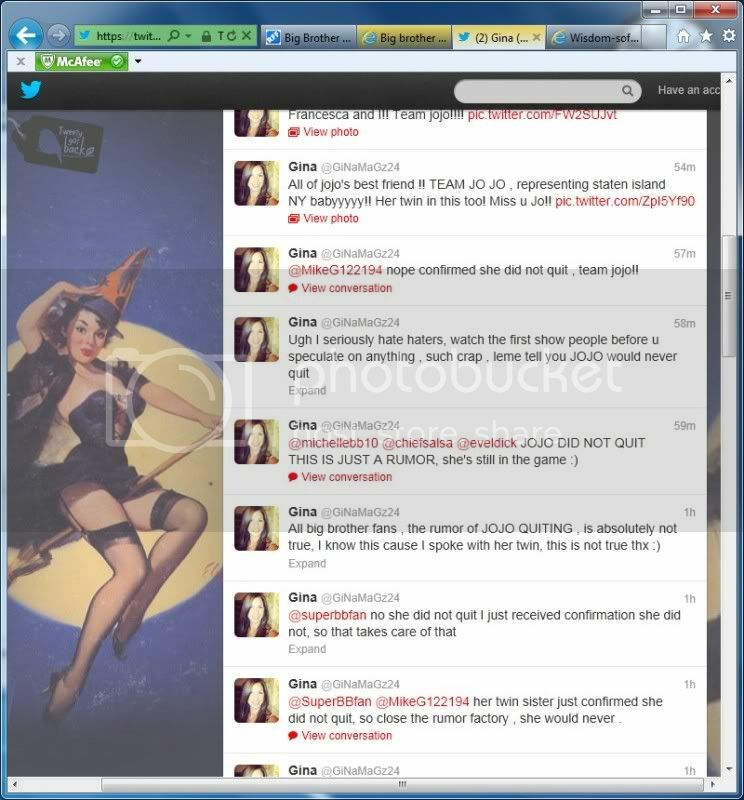 These are the tweets that are floating around right now regarding JoJo Spatafora quitting and why she quit. : PLEASE NOTE THAT THIS IS NOT CONFIRMED! JoJo confronted with production about it and ended up quitting. Stay tuned for more info regarding this. The issues is and what was talked about on Rumor Control is that the returning HG are not eligible for the $500 and that their team has to win it for them. so how can the rumor of Janelle winning the first HOH be true unless they mis-spoke. and if they messed up that little bit of info then what else was messed up? Well...my sources, as i mentioned earlier, have told me Britney is the 4th. And You bring up a good point about Janelle being the HOH, that seems a little odd. Especially when from CBS's own website..."In a series first, four of the most successful players in Big Brother history will return to play their own game -- for their own separate prize." BTW..Ugot love the Cinnamon Toast Crunch, reference. LOL! Something does bother me about this though...Janelle was always great at comps, except endurance comps. I'm as big a Janey fan as one else, but she always had problems with the endurance comps. So I have to question her winning one, but I mean anything can happen. My gut tells me the rumor is FALSE. Not hearing anything new or seeing any follow ups. Still keeping my eyes out on the rumor. The day is still young so we shall see. I would tend to side with you on that Will, especially since Janelle "won" HOH. If the returning HGs were suppose to play their own game, why would they be allowed to play in the HOH comp? The more I think about this, the less sense it makes. Sure, they're playing their own separate game, but they'll need the help of the new HGs to evict the other returning HGs, right? Could it be that Janelle's team won HoH? Remember BB11... how the cliques competed for their returning HG and how Athletes won and Jessie came in and was HoH..
OH GOD. Please, no teams/groups/multiples. I'm sick of that idea. The twitter poster mentioned (SuperpBBfan) above is only following 2 people both to be CBS. I went to Facebook and looked up Jojo's sister Francesca and she 's saying it's BS. (not using those words) She also says in her timeline that she can't speak about anything because she signed a contract. WHICH all family members do. So ether someone is going for 15 mins of fame and then the unemployment line or they got their facts messed up and still heading for the unemployment line! In other news all remaining HGs except for Boogie, Dan, Janelle, and Britney have been kicked out for throwing their mics in the pool! I read on another forum that Janelle won the veterans comp, not HOH. Winning meant she got to pick first which HG would be on her team. Let's put this rumor to rest. It is 100% false. Thanks, Howie! I tried embedding using Flash, but it didn't work. Oh well...hopefully it works next time. Good to see Chima finally found her sense of humor again!